Considered one of Hatteras Island's biggest attractions, over 175,000 visitors come to the Cape Hatteras Lighthouse every year to climb the 257 steps to the top. 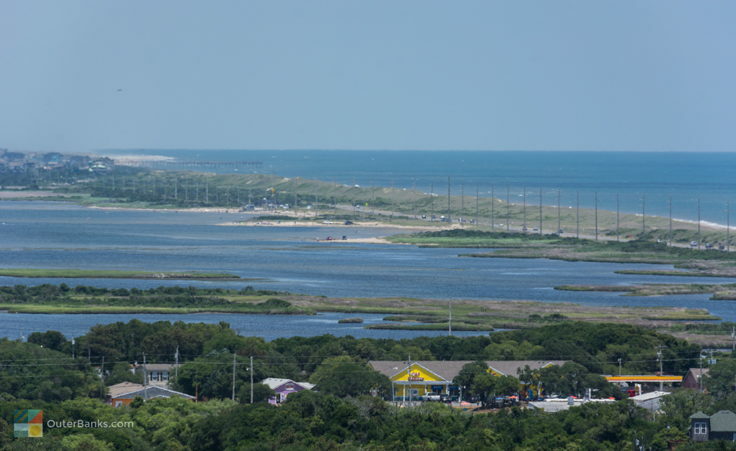 But don't let those large numbers of tourists scare you - Hatteras Island, and subsequently the Cape Hatteras Lighthouse, is known for being unpopulated and uncrowded, even in the height of summer, making it a very attractive destination for Outer Banks vacationers. The current Cape Hatteras lighthouse is actually the 2nd lighthouse to service Hatteras Island and the ships travelling offshore. The first 90' ft. lighthouse was authorized in 1794 and completed construction by 1803, but it was soon apparent that this first sandstone lighthouse was ineffective in protecting passing ships from the deadly Diamond Shoals. After decades of complaints, the US Government added 60' feet to the height of the lighthouse, making it 150' ft. tall, and painted the bottom half bright red to make it stand out during the day. The "new" lighthouse was finished by 1853, but just a couple years later after a number of rough storms, it was in need of extensive repairs. Deciding to start from scratch, construction on the current lighthouse began in 1868, and the present-day Cape Hatteras Lighthouse was first lit on December 1, 1870. The Cape Hatteras Lighthouse protected the waters off of Hatteras Island for over a hundred years, but by the early 1990s, the towering structure was faced with a new problem: beach erosion. Decades of storms, hurricanes and Nor'easters had all but eliminated the beach in front of the lighthouse, and the structure was in real danger of toppling into the Atlantic Ocean. In 1999, after years of careful planning, the Cape Hatteras Lighthouse and the surrounding outbuildings, including the principal keepers' quarters and double keepers' quarters, was moved 2,900 ft. inland to a safer location. The actual move itself took just 23 days, with lots of planning, set-up, and maintenance before and after the operation. In the end, the Cape Hatteras Lighthouse ended up being the tallest brick structure in history to ever be moved. Today the Cape Hatteras Lighthouse and outbuildings are all open to visitors, and remain safe behind a barrier of sand dunes and maritime forest in the heart of Buxton. The lighthouse is open for climbers seasonally from the third Friday in April until Columbus Day. Self-guided climbs begin at 9am and go to to 4:30pm. Tickets are inexpensive for adults, and even less for children under 11 and senior citizens 62 and older. Ticker sales begin at 9am and climbs happen every 10 minutes (maximum 30 climbers per time slot). These slots can fill up quickly on nice days. Also, the climbs can be stopped if temperatures inside the lighthouse become too hot. 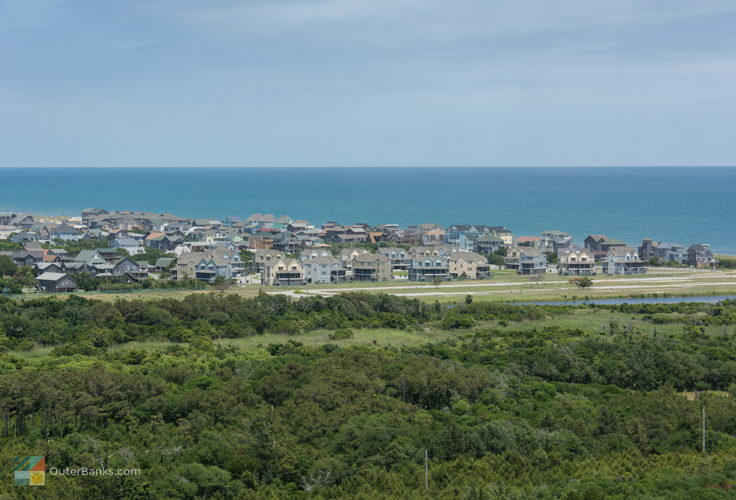 The reward for making the long hike up the lighthouse is a panoramic view that spans the majority of Hatteras Island, from Avon to Hatteras Village. Special full moon evening tours are available once a month and tickets can be reserved in advance. Be sure and reserve your full moon tickets early, as these popular climbs tend to fill up fast. The lighthouse is also available for weddings and special events. A Special Use Permit is required for weddings by the National Park Service (at least 45 days in advance), but at a small cost (around $100), the Cape Hatteras Lighthouse is an attractive backdrop for Hatteras Island destination wedding couples. The grounds around the Cape Hatteras Lighthouse, including the two keepers' quarters buildings, are home to a lighthouse museum and gift shop filled with books, toys, and lighthouse souvenirs. There is also a shaded picnic area nearby, a .75 mile nature trail, and the beach ramp access to Cape Point. Where is the Cape Hatteras Lighthouse? The Cape Hatteras Lighthouse is located HERE in the town of Buxton on Hatteras Island, in the Outer Banks of North Carolina. When was the Cape Hatteras Lighthouse built? Construction began on the current Cape Hatteras Lighthouse in 1868, and the lighthouse was first lit on December 1, 1870. Its predecessor, which had to be replaced as it was ineffective for passing ships, was built in 1803. What is the tallest lighthouse in North Carolina? The Cape Hatteras Lighthouse is the tallest lighthouse in North Carolina, and measures a little more than 200 feet from the foundation to the top of the lighted tower. How many steps are in the Cape Hatteras Lighthouse? There are 269 steps from the ground level to the lens of the Cape Hatteras Lighthouse. How do you get to the Cape Hatteras Lighthouse? Visitors can reach the Cape Hatteras Lighthouse from the north via NC Highway 12 across the Bonner Bridge, and from the south via the Hatteras / Ocracoke ferry. Once in Buxton, visitors will want to turn on the appropriately named Lighthouse Road. Can you climb the Cape Hatteras Lighthouse? 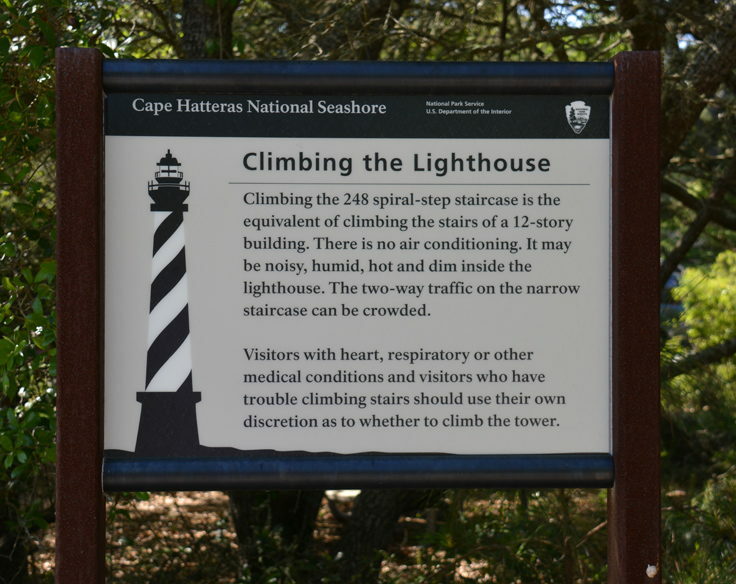 The Cape Hatteras Lighthouse is seasonally open for climbers. When can you climb the Cape Hatteras Lighthouse? The Cape Hatteras Lighthouse is generally open for climbing from the third Friday in April through Columbus Day weekend in October. Can you climb the Cape Hatteras Lighthouse at night? The Cape Hatteras Lighthouse offers seasonal full moon tours once a month in the summer months, generally from June through August. Full moon tours fill up quickly, and advanced reservations are highly encouraged. Does it cost money to climb the Cape Hatteras Lighthouse? There is a small fee for climbing the lighthouse, with discounts available for senior citizens and children. Why is the Cape Hatteras Lighthouse important? The Cape Hatteras Lighthouse is the tallest brick lighthouse in the country, as well as the tallest lighthouse of any kind in the state of North Carolina. It is also distinctive for its black and white candy cane striped pattern, which is one of the most utilized designs in lighthouse artwork and images in the world. Why was the Cape Hatteras Lighthouse moved? The Cape Hatteras Lighthouse was moved at the end of the 20th century, as due to years of erosion, the structure was dangerously close to the ocean. When it was built in 1870, the lighthouse was a safe 1,500 feet from the ocean waves, but by the late 1900s, the structure was less than 100 feet from the water. When was the Cape Hatteras Lighthouse moved? The Cape Hatteras Lighthouse was moved in the spring and summer of 1999, and was successfully placed on its new foundation on July 9, 1999. Where was the Cape Hatteras Lighthouse moved to? The Cape Hatteras Lighthouse was moved 2,900 feet from its original location to a more protected spot just south and slightly inland of its original site. Who owns the Cape Hatteras Lighthouse? The Cape Hatteras Lighthouse is part of the Cape Hatteras National Seashore, and is managed and operated by the National Park Service. Where can you stay near the Cape Hatteras Lighthouse? Visitors can stay in the town of Buxton, where the Cape Hatteras Lighthouse resides. This town on Hatteras Island has a number of hotels, motels, and bed and breakfasts, as well as a campground next to the lighthouse, and a number of vacation rental homes. Are there tours of the Cape Hatteras Lighthouse? Tours are regularly available of the Cape Hatteras Lighthouse through seasonal climbs. In addition, the Cape Hatteras Lighthouse has monthly full moon tours that take place after dark. Do I need reservations to climb the Cape Hatteras Lighthouse? Reservations are recommended for special lighthouse tours, like the monthly full moon tours in the summertime. Otherwise, visitors can pick up tickets at the on-site ticket office on the day of climbing. Are there special events at the Cape Hatteras Lighthouse? The Cape Hatteras Lighthouse has special full moon tours once a month, as well as regular “Lighthouse Talks” throughout the summer which explore the history of this local landmark. 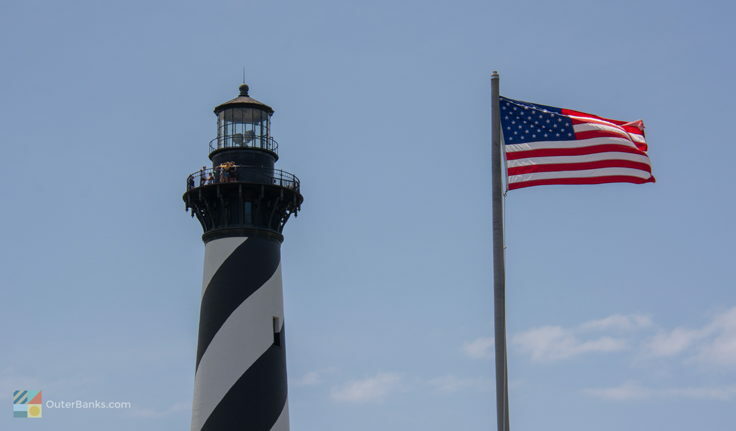 In addition, the Cape Hatteras Lighthouse is the site of the annual 9/11 Memorial Lighthouse Climb, where local volunteer firefighters and emergency personnel make a trek to the top of the lighthouse in full gear. Is the Cape Hatteras Lighthouse operational? The Cape Hatteras Lighthouse is lit nightly, 364 days a year. How often is the light rotation at the Cape Hatteras Lighthouse? The light at the Cape Hatteras Lighthouse flashes every 7.5 seconds. How far away can you see the light from the Cape Hatteras Lighthouse? 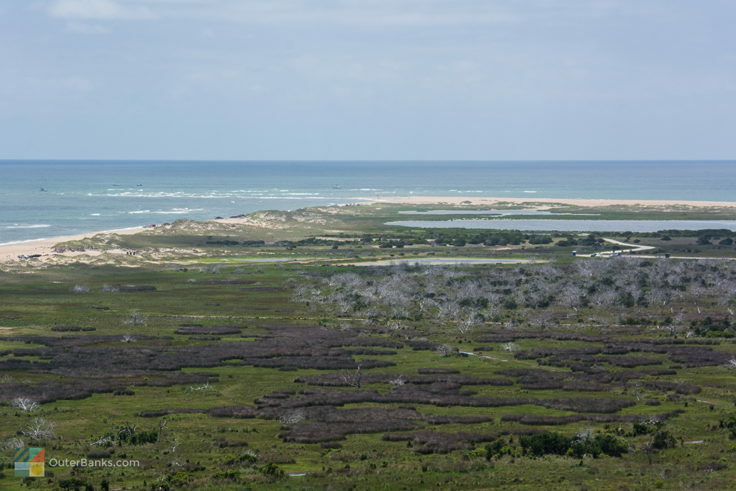 The light of the Cape Hatteras Lighthouse is visible up to 20 miles away. 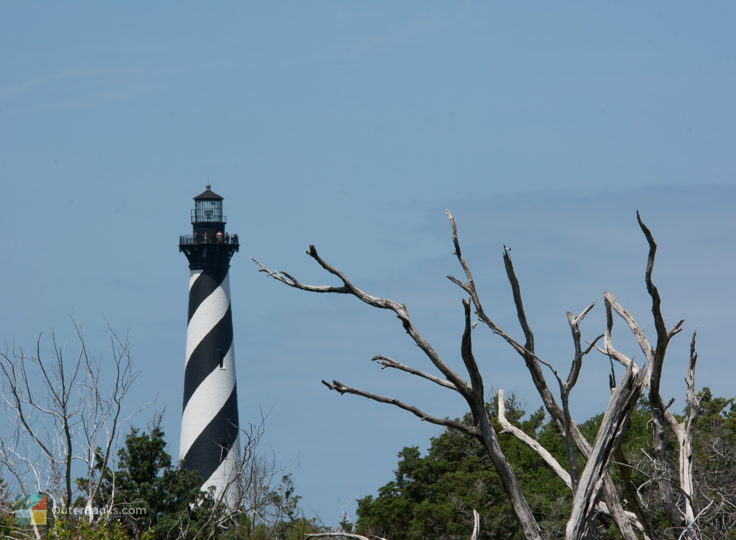 What kind of light does the Cape Hatteras Lighthouse have? 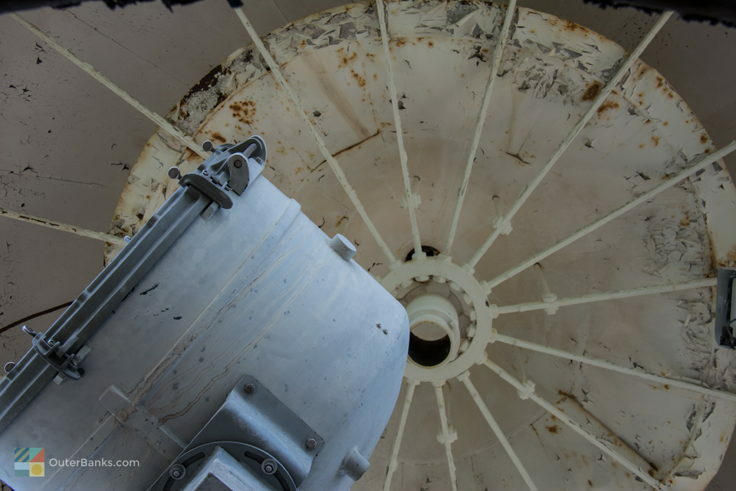 The Cape Hatteras Lighthouse has an 800,000-candlepower beacon installed, which consists of a rotary beacon with two 1000-watt lamps. One of the original Fresnel lights within the lighthouse can be viewed at the Graveyard of the Atlantic Museum in nearby Hatteras village. Is there a Cape Hatteras Lighthouse museum? A Cape Hatteras Lighthouse museum and visitors center is located at the base of the lighthouse, and is housed within the original keepers’ quarters. Where can you eat near the Cape Hatteras Lighthouse? There are a half dozen restaurants that are within a mile of the Cape Hatteras Lighthouse, and which are located along NC Highway 12 in the town of Buxton. Does the Cape Hatteras Lighthouse have a gift shop? 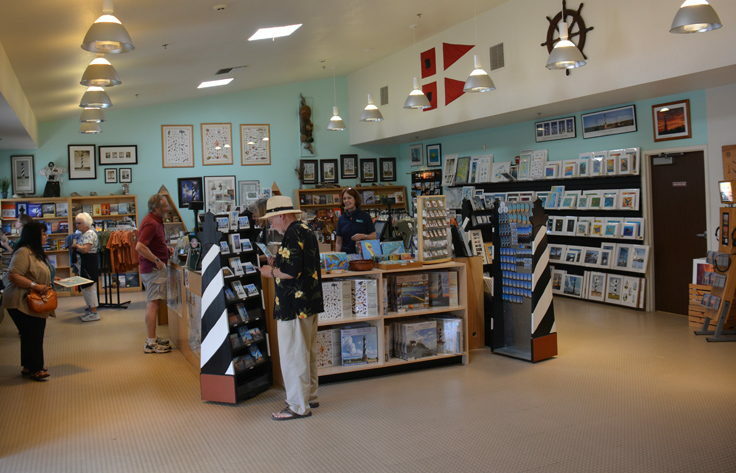 A gift shop is located just steps away from the Cape Hatteras Lighthouse, and souvenirs can be found at a number of locally owned stores in the surrounding town of Buxton. Are there restrooms at the Cape Hatteras Lighthouse? Restrooms are located at the base of the Cape Hatteras Lighthouse, next to the visitors center and entrance area. There is also a drinking fountain and bottled water available at the gift shop. Call 252-995-4474 for current hours.